reasonable p rice, and you want it now, then Hosted Exchange 2016 from Geek Experts is right for you. Businesses choose Geek Experts Microsoft Exchange hosting service for the reasons of cost, convenience, reliability, and productivity enhancing features. 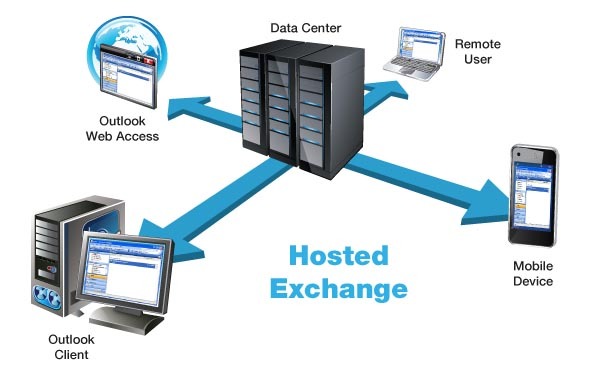 Our Hosted Exchange Server joins the data from various devices including desktops and smart phones, synchronizing your vital business information so it’s always current and available to you no matter where you are. Since all the data in your Outlook mailbox such as contacts, messages and calendars, are stored centrally on our Cloud based Exchange Servers, employees can use multiple devices to fully access their entire mailbox which seamlessly synchronizes across devices and platforms – automatically, in real-time. Should your internet go down, your email is still being delivered to your mobile devices since your email is stored in the cloud. There are significant upfront and ongoing costs involved to implement Microsoft Exchange Server 2016. Geek Experts, a leading managed services provider, has already invested in the required infrastructure and achieved economies of scale. Microsoft Exchange server hosting services from Geek Experts offer significantly lower costs than an in-house server. Further, when comparing hosted Exchange online plans with competitors, check if their plans include unlimited mailbox size, free ActiveSync, and 24/7 phone support. You will find that Geek Experts hosted exchange pricing is among the best in the industry. Geek Experts Microsoft Exchange hosting service plans offer the convenience of pay-as-you-go model with month-to-month billing, no setup fee and no long-term contracts. Sign up today! Within minutes, start managing your business Exchange hosting account through a user-friendly web-based interface. You have choices of plans with options to add Exchange archiving or to obtain a copy of Outlook. You have the option to keep your existing domain provider or purchase a new domain from Geek Experts. Through the split domain option, some users can be on the hosted Exchange email platform, while others may stay on regular POP3 mail accounts. Whether you are moving from an in-house Exchange or Lotus Notes mail server, an existing Microsoft Exchange hosting provider, or upgrading from POP3 or IMAP accounts, Geek Experts experienced team is there to help you in migrating to our hosted Exchange online services. In today’s business, instant access to e-mail and contacts is priceless. It is not uncommon for employees or IT staff to forget to backup their data. The penalties for such actions can be heavy. Geek Experts has the reliable infrastructure, support, and best practices that make sure that your data is safe and available all the time from multiple locations, browsers, and e-mail software. Monthly billing, no long-term contract. You can upgrade or downgrade Microsoft Exchange hosting plans from the control panel. You can have some users on your domain on MS Exchange hosting and others on your regular mail account. Bring your own domain, use Geek Experts sub-domain, or purchase new domain from Geek Experts for your Microsoft Exchange hosting online accounts. Geek Experts use clustered server’s infrastructure in reliable data centers to provide shared MS Exchange hosting customers with 99.99% up-time. Daily backups ensure that your data is never lost. You get 24/7/365 phone, e-mail, and chat support from a Microsoft Gold Certified Partner. Through the web-based control panel, the account administrator, individual users, and resellers can add/delete mailboxes, contacts, groups, and edit user settings such as passwords, Aliases, Auto Reply, Filters, Distribution Lists. Protocols such as POP, IMAP, SMTP, RPC over HTTPS are supported. Microsoft OWA 2016 included free with hosted exchange accounts allow users on the road to access their e-mail through a standard web browser with features like Microsoft Outlook. The improved OWA 2016 is now optimized to work with desktops, laptops, tablets, and smartphones. OWA is friendlier to touchscreen inputs and works in an offline mode. Free ActiveSync synchronization of e-mails is included with every MS Exchange hosted account, to a variety of mobile devices including iPhone, iPad, Android, and Windows Mobile phones. Geek Experts’s Anti-Spam software continuously protects against spam as well as helps users to set filters, rules, and manage safe sender lists, safe recipient lists, and blocked sender’s lists. Hosted Exchange 2016 Plus includes integrated email archiving, retention, and discovery capabilities. All incoming and outgoing e-mail messages and attachments in MS Exchange accounts are scrubbed by anti-virus software before they are forwarded to their destinations. Each MS Exchange 2016 Plus hosting account includes a free download of Microsoft Outlook for Windows PCs. Search in Exchange 2016 learns from the behavior history of users to enhance and prioritize search results in Exchange. Remote wipe can be used to erase sensitive data from a lost mobile device. Geek Experts Microsoft Exchange hosting permits attachments up to 150 MB size in e-mails. Hosted Exchange online users under one company account can maintain personal and shared calendars, task managers, public folders, companywide Global Address lists (GALs), and can arrange group scheduling with real-time availability.